A year after taking the top spot on business magazine Fast Company's list of the "World's 50 Most Innovative Companies" in the world, Apple has fallen to 17th place behind both established corporations and fresh startups. Apple SVP of Worldwide Marketing Phil Schiller introduces the A12 Bionic in September 2018. Published on Wednesday, Fast Company's annual list puts Apple in the No. 17 spot for its advancements in chip design. An accompanying explainer points to the A12 Bionic system-on-chip, which features 6.9 billion transistors in a unique package tailored for efficient processing of artificial intelligence, augmented reality and photography tasks. "Apple's most impressive new product of 2018 wasn't a phone or a tablet, but a chip: the A12 Bionic," writes Harry McCracken, Technology Editor at Fast Company. "At a time when it remains tougher than ever to induce consumers to upgrade, as proven by Apple's surprise January move to cut revenue guidance on sluggish iPhone sales, the innovative chip design positions the company to create a whole new generation of irresistible experiences." Released with iPhone XS last year, the A12 Bionic is built on a 7 nanometer process, allowing for an extremely dense six-core design. 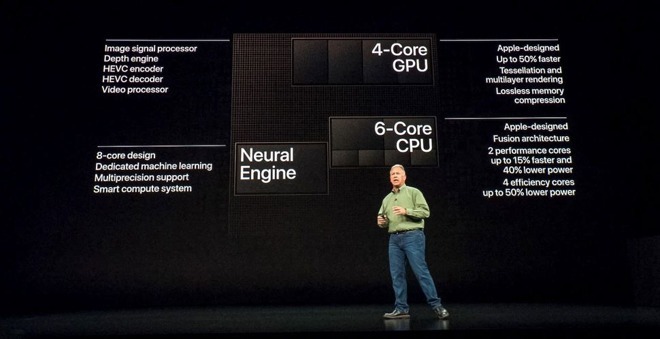 According to Apple, the A12's two high performance cores are 15 percent faster than 2017's A11 Bionic, but consume 40 percent less power, while four efficiency consume 50 percent less energy. Benchmarks bear out Apple's claims, with tests showing markedly increased performance that rivals some desktop CPUs. Above Apple in Fast Company's rankings are established corporations including The Walt Disney Company, the National Basketball Association and Target, which are respectively recognized for delving into the streaming business, creating an esports league and creating lucrative in-house brands. Tech companies like Alibaba, Square, Twitch, Shopify, AnchorFree and Peloton also placed ahead of the iPhone maker. First and second on the list are China's Meituan Dianping and Singapore-based Grab, so-called "transactional super apps" that connect millions of people through a collection of lifestyle products and services. Apple took the first spot last year on the back of an "ambitious" approach to hardware and software engineering. The company's A-series processors were also cited as a positive, as were initiatives like CareKit, Apple Music and AI. Joke. Several at the top on the list are all copying other breakthroughs. No worry, though. It's just someone else's opinion. And meanwhile, Apple will make more money this year than all the 16 companies above it combined. NO recovery within 3 years. lol, apps, food and clothing is not that innovative. Cramming as much tech as they do into something that fits in your pocket so those apps can actually work, that’s innovation. Domino's is #19! What did they do? Improve the flavor of their boxes? Apple at 17 is fair. Iterative improvements shouldn’t count for innovation. Tesla, Google, Amazon have to be top 5. Look at all these people here saying the ranking doesn’t matter. They’re the one who would have applauded the list if they’d ended up #1. Yeah, so a bit of a drop from record sales equals sluggish. Also, FastCompany. Hahaahaaaaaaaaaaaaa whatever. Just because Apple makes complicated tech look simple, people feel like it’s small change. AirPods have W1 ,iPhone has A12 (faster than the Snap 855) ,iPhone X has the TrueDepth camera (still no one else has put in a mainstream phone) almost 1.5 year later. Other companies have innovations too. But putting apple in the 17th place is utterly ignorant. Apple hasn't done anything interesting in the past 10 years. What happened to the Macs in the past 10 years? What happened to the iPhones in the past 10 years? What's new with the iPads? Nothing really. Where is the specs bumped affordable Mac mini? Where is the gimmick-free (no touchbar), affordable 15" MacBook Pro? And what's happening on the software side? Anything interesting? Not really. Apple used to be a tech company. Now they are just an iPhone company. Trying to squeeze what they still can from the iPhones... We used to get excited about Apple keynotes. There was always something new, something interesting that Steve Jobs introduced. What do we get these days from Apple? Emojis. With a price hike. How original. As I understand it Alibaba's business model is more focussed on business to business commerce than Amazons. They're not really that similar. They ( Tesla, Amazon, Google ) aren't in the top 5. You could have just hit the link in the article and looked at the list yourself, instead of rushing to make a comment that doesn't make sense. The NBA is # 3 and the Walt Disney Company is at #4... So this list is confusing at best in my opinion. A typical consumer cares less about how much profit a company is making on them and more about "the magic". I certainly don't like being reminded how gullible I am when it comes to tech and the excessive (IMO) profits some companies realize from selling it to me. If you're not a serious investor in them why cheer-lead "PROFIT!"? FWIW Apple did come in at #1 in consumer electronics. Better now? Sure Apple may not be most innovative company in the world, but this “list” is total garbage. Half the companies on this list will be out of business by next year. Tesla, Google, Amazon, Samsung, Microsoft, Huawei, Xiaomi do not appear on the list at all. Of the tech companies regularly discussed here as superior to Apple in innovation none of them are on the list but Apple. Are you ready to declare this list garbage now?